While many people find winter fishing to be uncomfortable and nonproductive, I have always loved it. Well, not always. About fifteen years ago I used to winterize my boat and leave it alone for a few months. 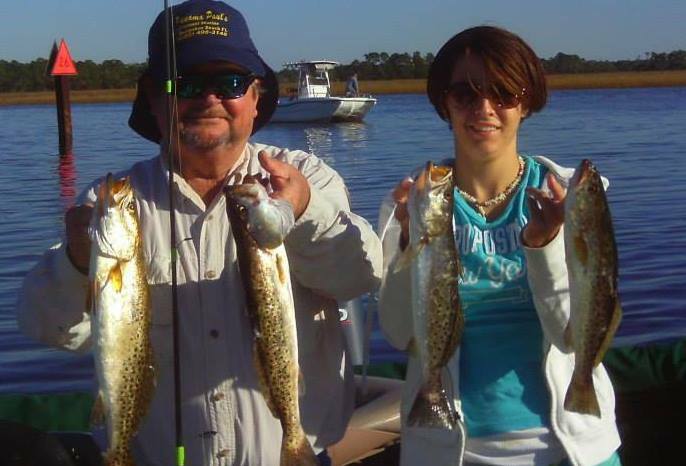 The flats I usually fished were empty of sea grass and baitfish and I never caught anything. 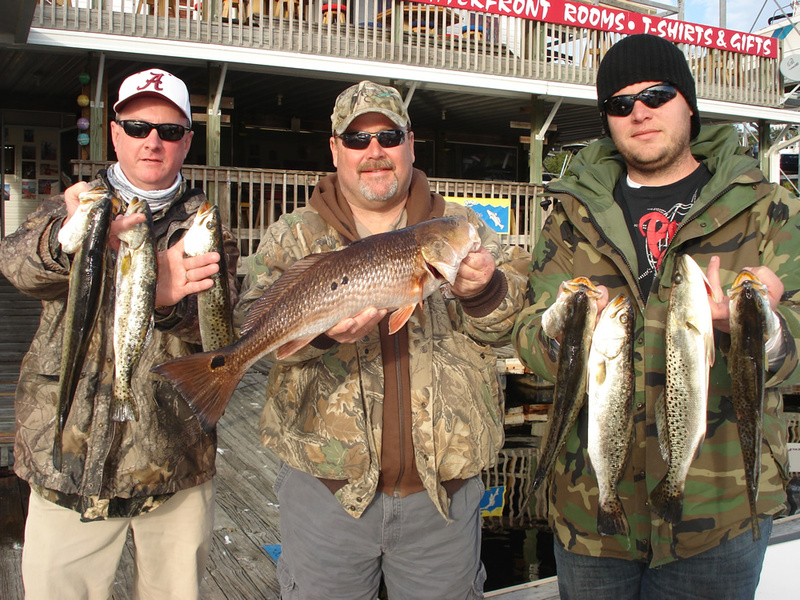 But over the years, I’ve found that winter fishing can be excellent, especially inshore. The major challenge is not so much the temperature, but the weather in general, and this January was a great example. With two bitter cold fronts coming through, and high winds on most days between them, it’s been one of the more challenging months to find fish. 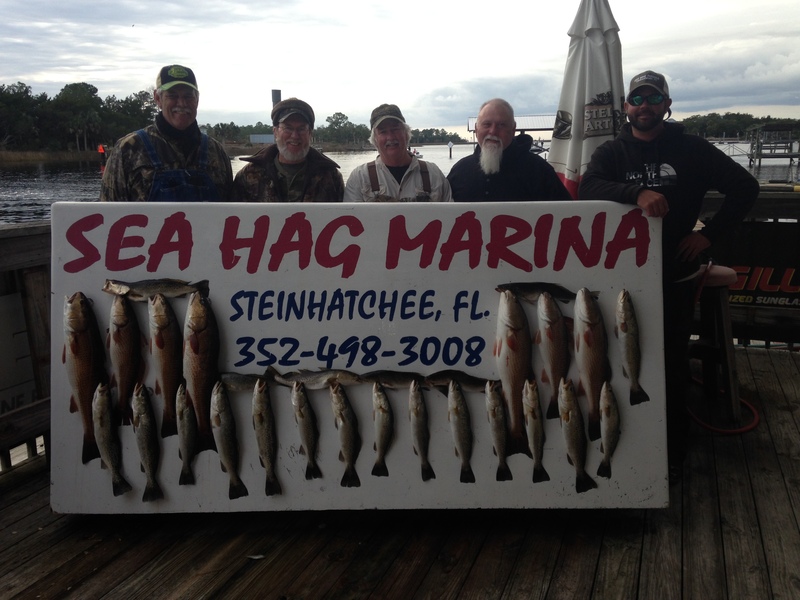 Luckily, this year has been fairly consistent with regard to speckled trout fishing in the Steinhatchee River, and so long runs through heavy seas aren’t necessary to find limits of trout. 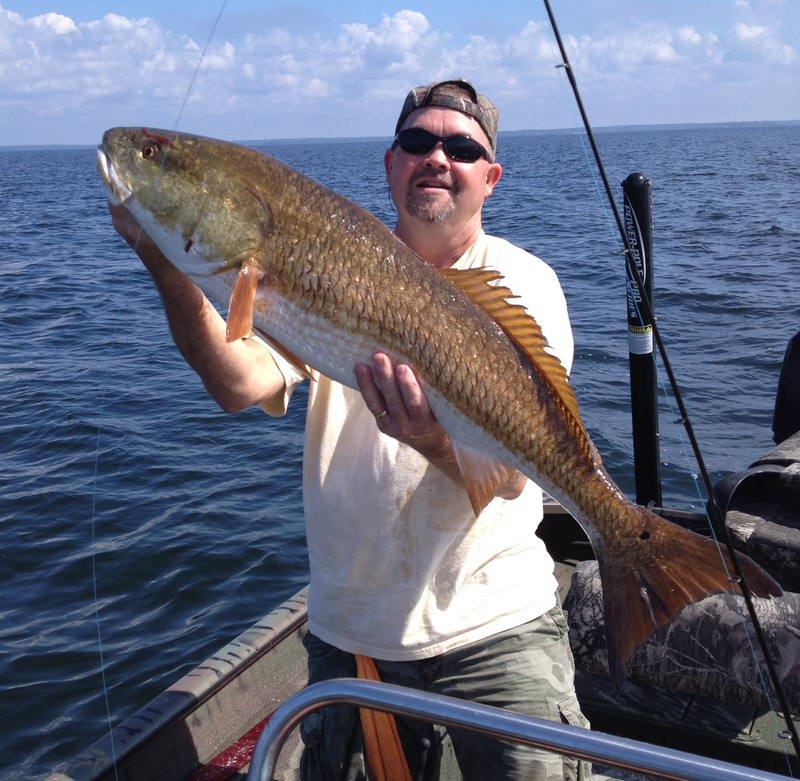 And on good days, and with a shallow draft boat, one can find some excellent redfish and trout in close, as you can see from the pictures. We’ve also had some excellent flounder brought in this month. In addition to the weather, one has to deal with winter tides, and I’ll go into more detail about them in the forecast for February. Offshore, however, is pretty much at the mercy of the weather gods, and it was hard to get out for our offshore guys this month. I had some interesting trips this month, including a visit from Jerry McBride, a writer for several kayak magazines. 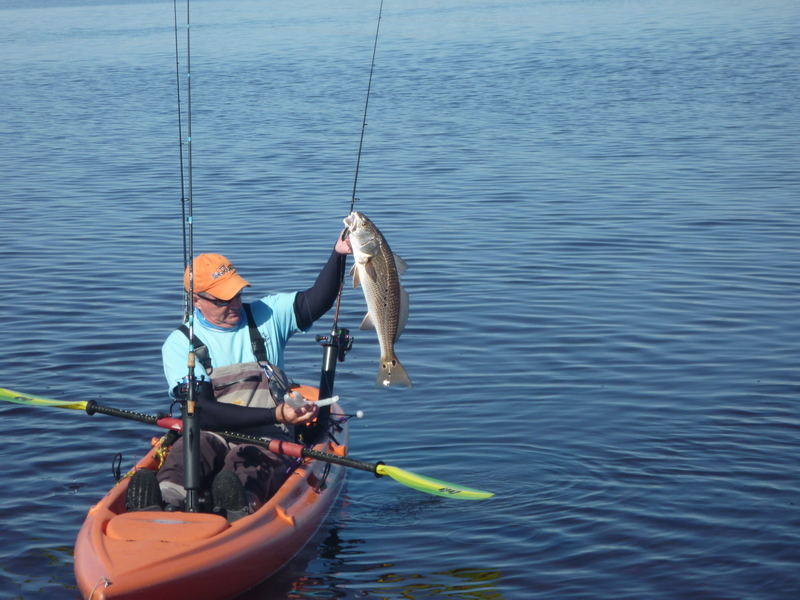 Kayak fishing is getting more and more popular in our area, and we were lucky enough to get some good weather and he showed us how it’s done. For a more complete story of his trip, go to my blog post. Bill and Sheila Rees, fishing from their airboat, found this fantastic wintertime mixed bag in a nearby creek, including two sheepshead. They were fishing Gulp! baits on jig heads in creek holes and in creek mouths. Sea Hag’s own Derek Snyder with a beautiful redfish taken near oyster bars on his day off. 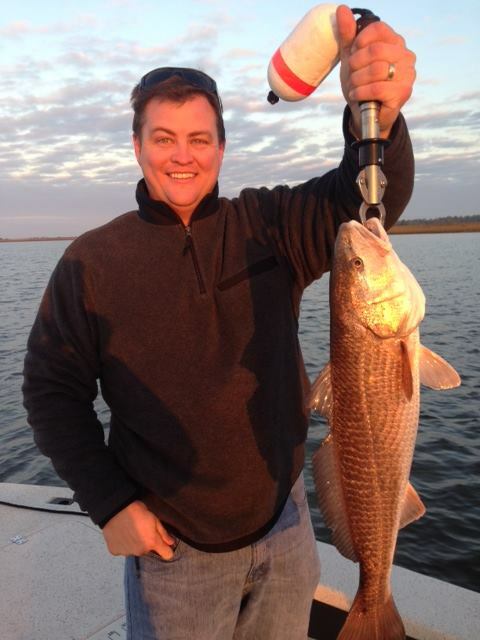 Harry Bell, from Middleburg, Florida found this perfect tournament redfish south of the Steinhatchee River. 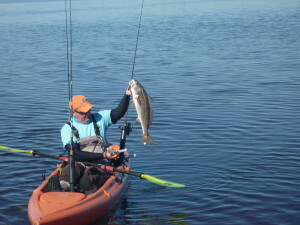 Jerry McBride from Jensen Beach with a gator trout and upper slot redfish caught kayaking bars and rocks near the river. 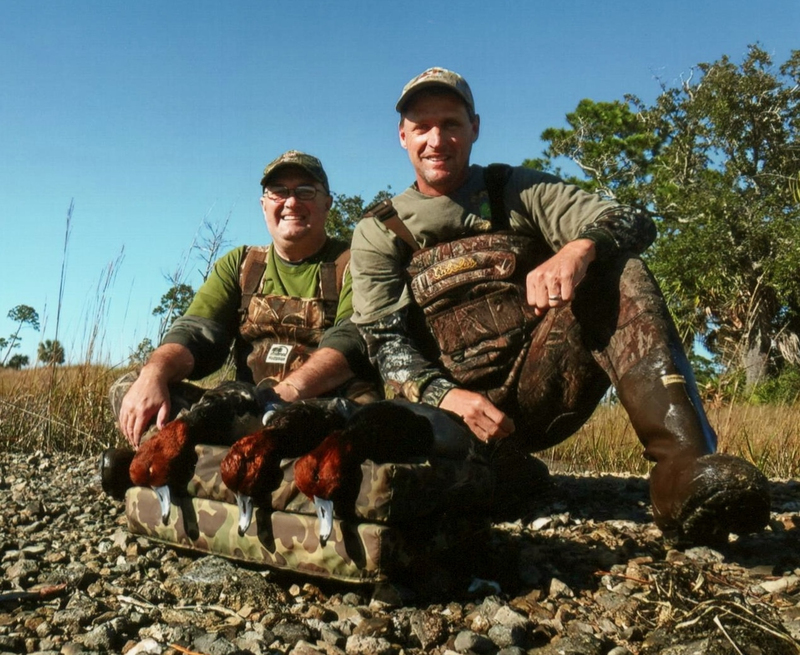 Duck season was a good one in Steinhatchee…Jim Doyle and Richard Maris nailed these fine birds. 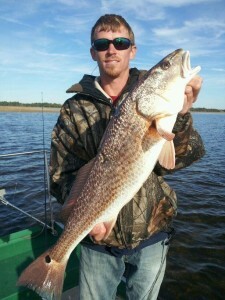 Josh Guy with a bull redfish caught on some near shore bars. Kelly Giles from LaGrange, Georgia, with some fine river trout. Ken Ford, with Mark and Troy Lewis from Warner-Robbins, Georgia with a great inshore mixed bag. 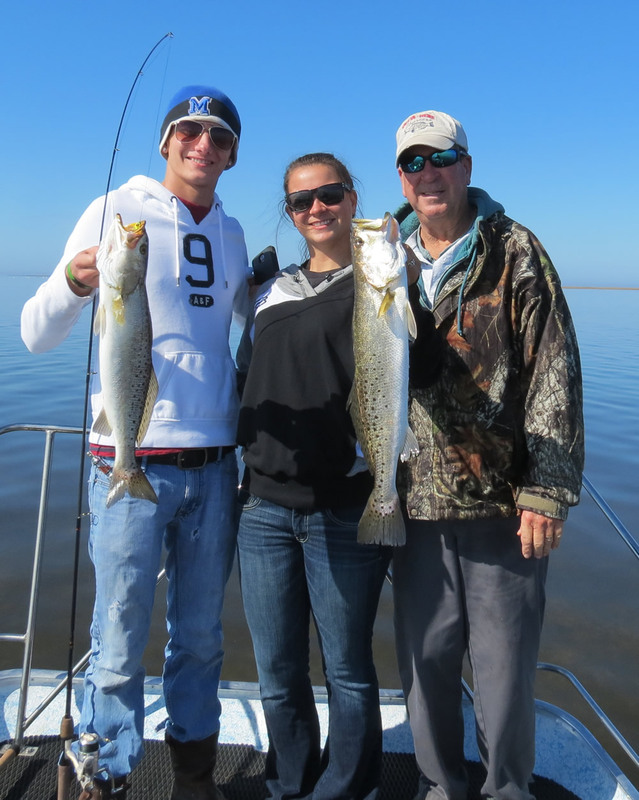 Larry Keen went fishing with Nancy and Wayne Emery found these upper-slot trout on some nearshore structure. 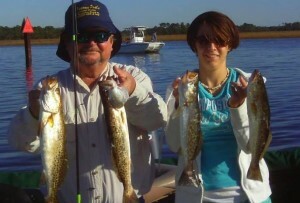 Lindsey Trowell from Jacksonville with a big redfish caught while fishing with Dr. Doug Barrett. 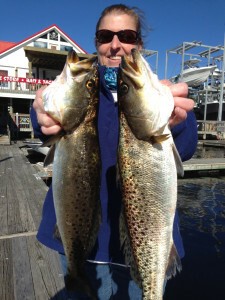 Sheila Rees with a giant trout at the Sea Hag: 6.72 pounds! 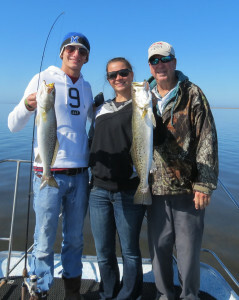 Old buddy Sidney Hazen and his daughter Nikki found these nice river trout. 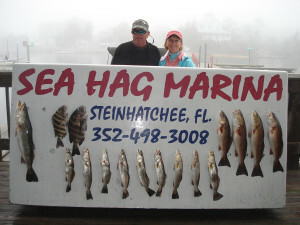 We can expect very similar fishing to January, with the possible exception of an early sheepshead bite. Ordinarily in late February into March the larger sheepshead move to offshore structure in our area to spawn. 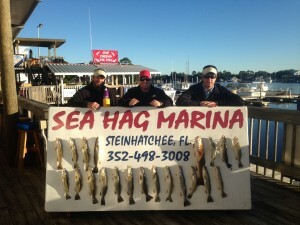 It’s a great fishery, but one that is frequently abused because of the high limits of 15 fish per person. We’ll have a special sheepshead section next month, but there have been early reports of a few fish taken, so keep in touch with the Ship’s Store to check on the bite. The pelagics (kingfish, Spanish mackerel and cobia) are gone from our area for a few more months, but offshore fishing still can provide some red grouper, amberjack and lots of large sea bass and Florida snapper for some great eating. 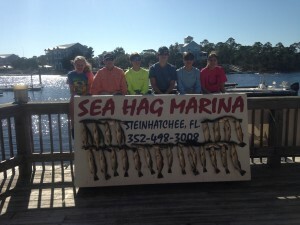 Inshore fishing is tide dependent this time of year. 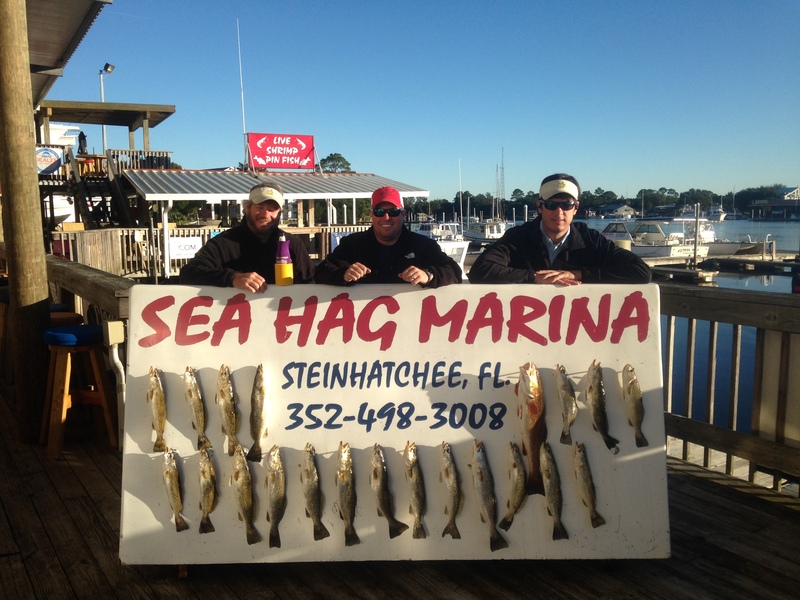 Steinhatchee has a diurnal tide pattern, with two highs and two lows most days. In the summer, the higher of the low tides is during the day; in the winter, the lower takes precedence. Given the local rocky and shallow shorelines, that can make getting around a real challenge. Knowing the capability of your boat and the daily tides are essential. How shallow can you run on plane? Do you know exactly where you’re going when you come off plane? There are a lot of deep cuts and holes in the flats that most of us have marked; these allow you to either jump up on plane, or come off plane safely. Additionally I always try to run on an incoming tide to decrease my wait time just in case I end up on a mud bar. 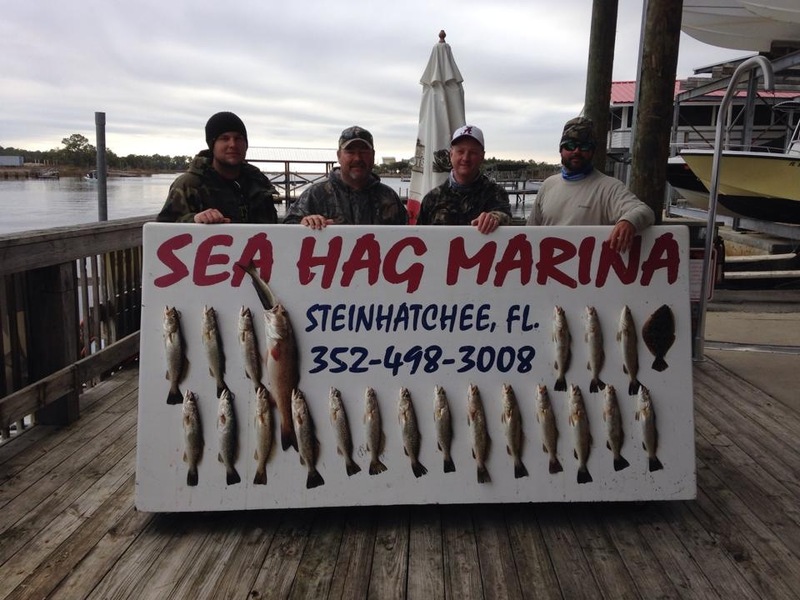 Some of these nearshore holes can provide some great fishing on low water. The deep creek beds offshore of Dallus Creek, the long Clay Creek cut which is easily visible on all maps, some creek beds west of Rock Point, the channels at Rocky Creek and Pepperfish Keys, and a deep trough west of Pine Log island all can provide some action on low water. Fish are looking for warmth, and when the air temperature is very low, the flats are chilly…but deeper water provides some warmth. That’s why the river is a great destination in cold weather, and so are the deep cuts in the flats. As the tide comes in, you can work your way toward the shorelines. A lot of the shallow areas are exposed to the sun all day, by the afternoon these areas are warmer, especially if they have rocks or oyster bars. This is where you can find some excellent redfish and larger trout. It’s not unusual for us to wait until midday to head out if the temps are cold and the water is low in the morning. Be very careful, though. You would not want to spend a cold night on the water waiting for the tide. Make sure you have cell phone service or a VHF radio handy just in case. If you are new to the area, consider hiring a local guide for a day. You can learn a lot. 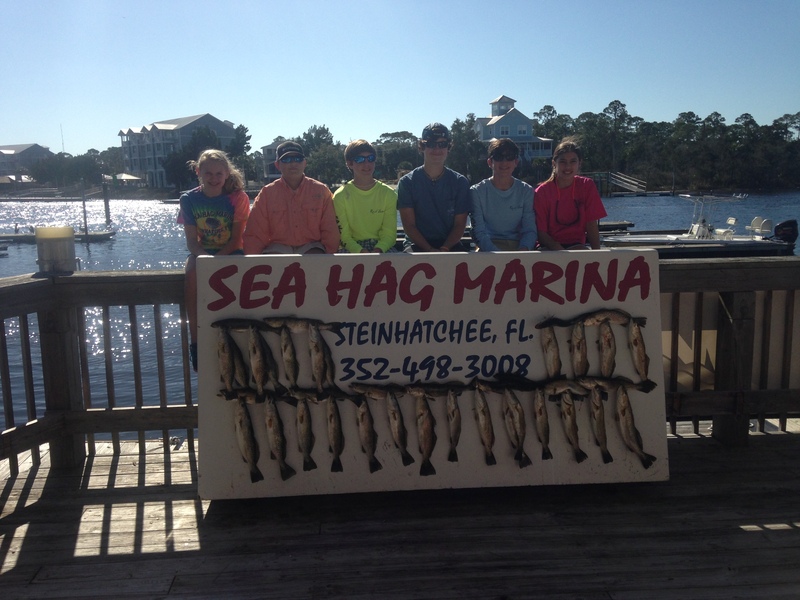 And if you are hesitant to bring your own boat, the Sea Hag Marina has some excellent rental boats that are set up for fishing our area. When the water gets in the low 50-degree range, you need to slow down your fishing. 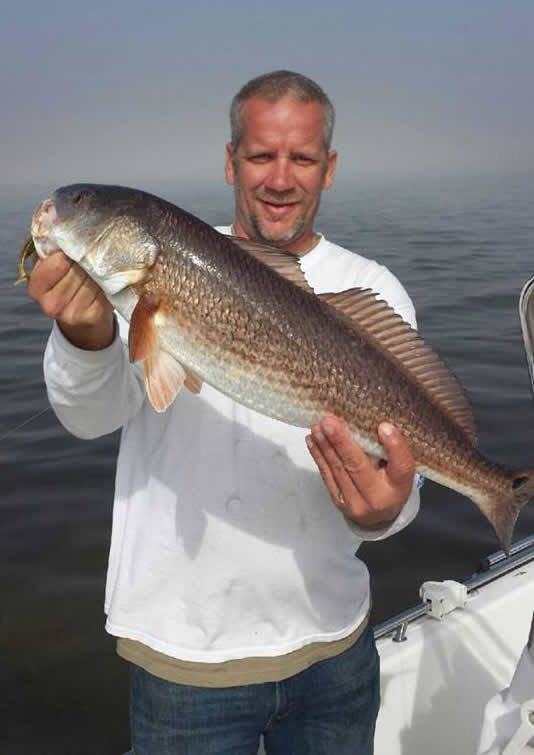 Live shrimp under corks or free-lined are a good choice this time of year because there are fewer pinfish in close to steal your bait. 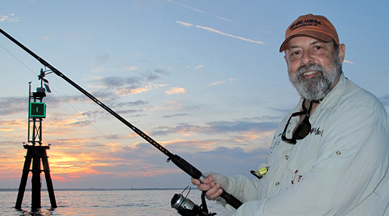 Lures are an individual choice, but topwaters are not likely to be productive. Try suspending lures such as the Paul Brown Corky Devil, the new MirrOlure Soft-Dine, Catch 2000, MirrOminnow (one of my favorites) and the Rapala subsurface walkers are excellent. Select the lure based on the depth you are fishing and the sink rate to keep the lure off the bottom. Floating jerk baits, such as the Cordell Redfin can also get a lot of fish. When you find a fish, work that area extensively because this time of year trout tend to school. Consider using lures rigged with single hooks instead of trebles if you are catching a lot of oversize fish to decrease their post-release mortality. Other than the chill in the air, wintertime is a great time to fish our area if you’re careful, take your time, and get some experience. Today– NE winds 20-25 kts occasional gusts of 30+ kts, seas 2-3’ building to 3-5’ with rogue seas 9’. Tonight– NE sustained wind 25 kts, gust to 35 kts, seas 4-6’ with rogue waves at or better than 12’. Tomorrow night- Possible gale warnings in effect, NE winds 10-45 kts, seas 6-8’ occasionally 17’. Children’s fiction books about talking rabbits, good guys always winning in the end and self-flight are more believable than the psycho-babble issued by a multi-degreed government brain-drained meteorologist who works from a cubicle in the middle of an office basement complex whom is secure he’s doing an outstanding job because he hasn’t been fired. Nonetheless, I’d bank on tomorrow’s forecast, after all, they are the federal government and they are here to help. 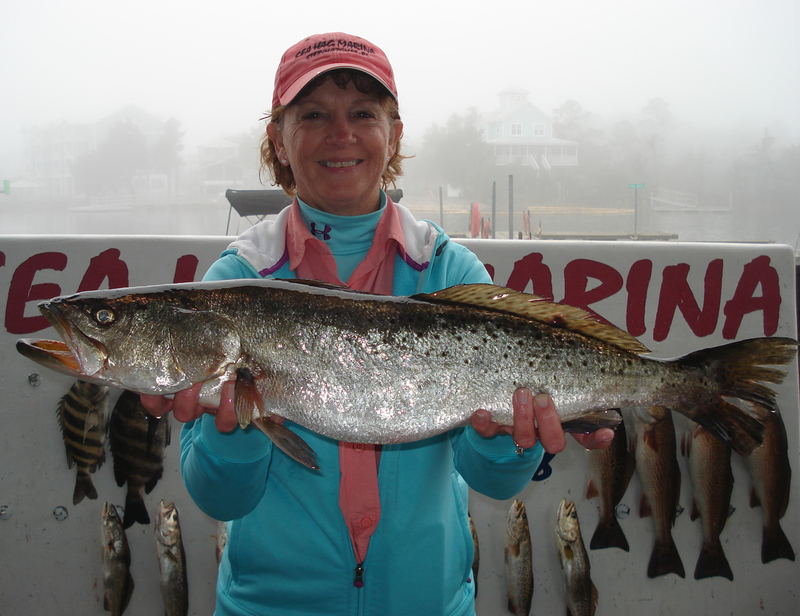 Looking at the sliver lining, the cold foul weather has pushed trout well up the Steinhatchee River seeking thermo-refuge. And, for us smart thermo-refuge seeking fishermen, we regularly hooked-up with the trout. 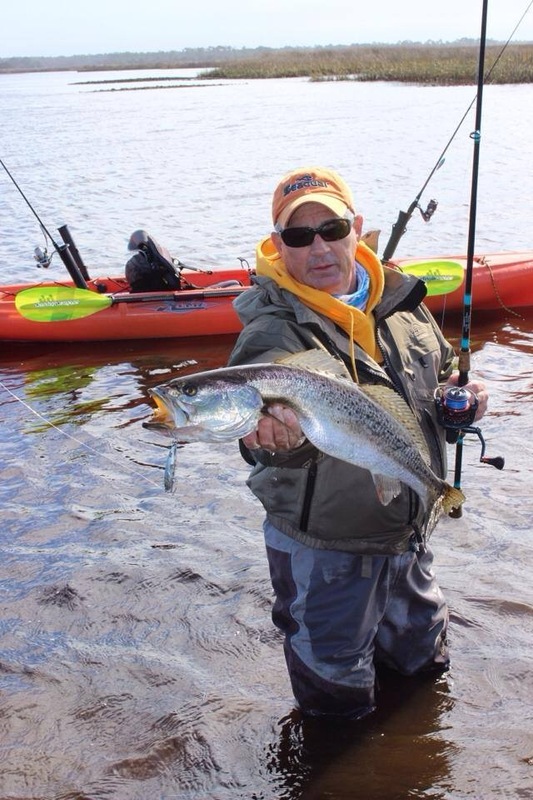 Mirr-o-lures are a long proven winter trout bait. But, if the fish will just as likely take a jig or shrimp, why impale them with nine hooks rather than a single when most of the fish are just a wee bit short of legal, anyway? Fish smart. Sheepshead have started showing up south of us, so I expect the melee to begin at any time! 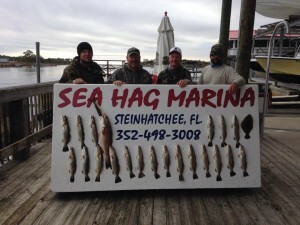 A short jaunt to the short reefs of Steinhatchee on a good day should fluff the box with some good eats. Don’t forget the sea bass are spawning and the bite is crazy: if you have 4 hooks on the line, 5 will come up, one so desperate it will take the sinker. Take advantage of the bluebird days of February! Or Spring- ready your tackle! In case you have not heard, trout are in the river. While most are small, if you stick with it you will manage a limit. 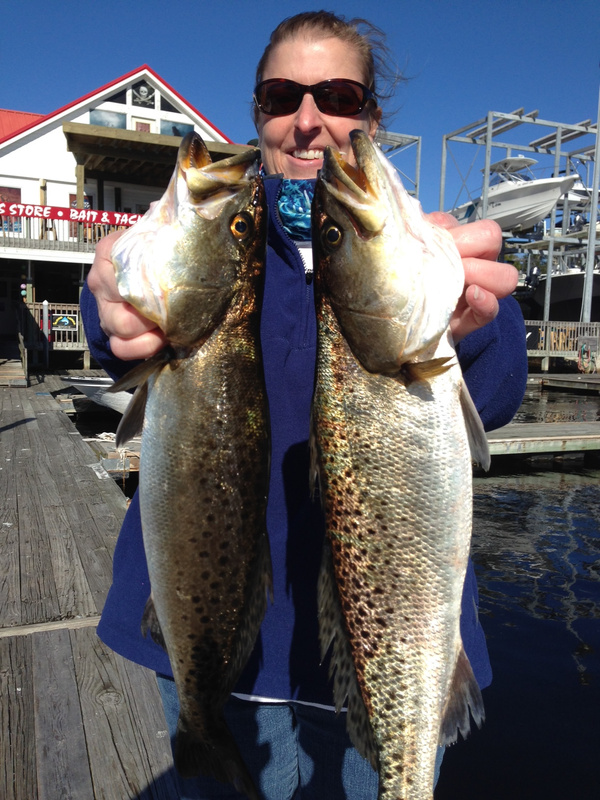 I am still catching limits of good trout on the flats and holes both north and south of the river. Been catching a few red fish in the slot on plastic baits mostly in dark colors. As the water temps start falling the trout will start leaving the flats for their winter spots. Plenty of sea bass to be caught around hard bottom. Booking up now for the 2014 season!